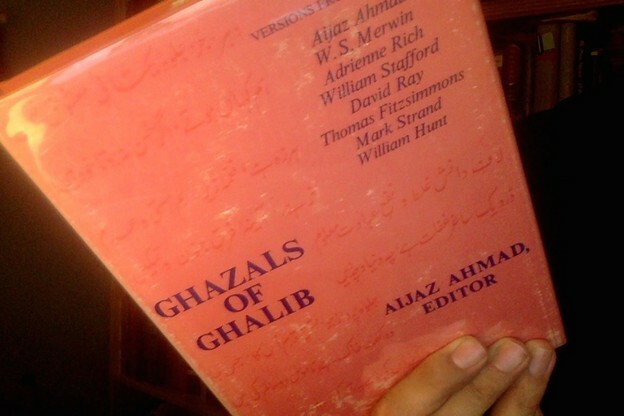 Bibliography: Ghazals of Ghalib: Versions from the Urdu by Aijaz Ahmad, W.S. Merwin, Adrienne Rich, William Stafford, David Ray, Thomas Fitzsimmons, Mark Strand, and William Hunt, ed. Aijaz Ahmad (Columbia University Press, 1971). Comment: In 1969 The Hudson Review printed a sadle-stapled chapbook (price: 50¢) containing twenty pieces by Mirza Asadullah Khan Ghalib: ten translated by William Stafford, and ten translated by Adrienne Rich. These two American poets were, at the time, fifty-five and forty years old, respectively. They were not quite what we would today call "emerging poets"—but kinda. Neither had a Pulitzer. Each had five books out. [ . . . ] The exercise was difficult; so, poets that we were, we chose to be playful. But a reprint, almost a quarter century later, of a work that so smacks of the impetuosities of youth involves for me a different, more dreary set of embarrassments. In the intervening years, my views have changed about everything that has a bearing on my own role in this book: the Urdu language and its poetics; the place of Ghalib in our literary and intellectual histories; my understanding of those histories as such; not to speak of poetry itself. Most things in the Introduction, and some in the apparatus I then provided for my collaborators, now strike me as wrong. It remains to be noted that the pieces below in no case translate entire ghazals. Ahmad selected couplets entirely pursuant to his own taste. He cites, as precedent, Indian anthologies, which (he tells us) traditionally print only the "best" couplets of any given ghazal. This means that any "conversation" between the themes of adjacent couplets below may or may not be present in the originals; it's never certain the couplets were next to each other. Ahmad does not tell us where he has made cuts, nor how long the poems were before they were cut. I have a copy of Ghalib's Urdu divan right here, but it's not much help since I can't read Urdu. One thing I can say: not too many of these poems are five couplets long. I would say seven to ten couplets is typical. Note: The Roman numerals on the poems are those present in the book, but I have arranged the pieces in the order they were in in the chapbook, where I first saw and fell in love with them. I trust this is sufficiently confusing. I have also silently omitted two poems that were in the chapbook. merely decorates the path for us connoisseurs of ecstasy. like a sunburst evaporating a globe of dew. I farm a deep revolt, sparks like little seeds. I am a votive lamp no one ever lighted. that's what the world fastens around us. It wasn't my luck to achieve heavenly bliss. No matter how long I lived, I'd never have made it. I'd have died of joy had The Great One proved the Word! if man's common suffering had really struck fire. But who could ever find the True Mate, the Right One? Could we sniff out soul-food, surely we'd do it. These high, religious longings, Ghalib! These vaporings! You'd seem religious if you didn't drink so much. may such treasure tumble open for us always. a stream rich as wealth from a temple. yet I could rejoice that the fair face begins to commune with me. Why in this night do I find grief? Why the storm of remembered affliction? Will the stars always avert their gaze? Choose others? and even my letters torn open? if God didn't hold His door open, we'd never enter. Himself that even a mirror could not reflect Him. or life's a mere game: Be, or be lost. No more campaigns. I have lost them all. A doused light, I can't stand all the convivial fraud. crooked, or the crystal ball distorts. The seer turns blind. but you never attain it by jiggling the senses. its only reward was the gleam while it vanished. but this heart that beat hopeful can't take it any more. you stagger and pour away your lives. listen to me, if your ears can take advice. the singer, she steals away your senses. heaven for the eye, heaven for the ear. no heaven, none of that old ardor. has guttered out; it too is silent, without any flame. many I've done, but never enough. worse, leaving your place I felt you-forsaken. Drink, for a spell, tarnished my name. Even a king once found some truth in the cup. it turns out he's worse off—even calloused, maybe. For God's sake, preacher, don't snoop the wrong temple. You might stumble on something better left neglected. hidden spots mark the heart of a cruel woman. a cry in a scarred, burnt heart, to that, is nothing. Fire doesn't do it; lust for fire does it. The heart hurts for the spirit's fading. hand under a stone, pinned there, faithful. Sun that bathes our world! Hold us all here! This time's great shadow estranges us all. Beauty finds itself, and we are found. no mirror finds the truth but in itself. emptiness takes us into its craving. that's all we have, known or not known. Earth receives the sky bent forever in greeting. least of all the skill to live humanely. standing in panic at the meeting-place. longing to open like eyelids and take her in. and yours, alive as the rainbow glistening through the orchard. Killing me off she sobs: "I never meant to hurt you!" Tears of repentance, wept three seconds too late. we recall one who bewitched us. Life could have run on the same. Why did we call her to mind? Again, my thoughts haunt your street. I remember losing my wits there. In the desert, my own house rises. some foreboding stayed my hand. All those meetings and partings! Days, nights, months, years gone! so enough of desiring and gazing. and the youth of the mind is over. a strong heart, a steady nerve, are wanted. when the violence of the world is all around me. What faces there must be still veiled by the dust! what word did the darkness speak to bring them forth in their nakedness? across whose arms you spread the veils of your hair. We are the single-minded; breaking the pattern is our way of life. Whenever the races blurred they entered the stream of reality. will see these cities blotted into the wilderness. their feathers dust of the desert, their force shrivelled to powder. Anyone who can still hope is seeing visions. The walls and doors of the tavern are blank with silence. that the dust of the bare road is lost in a carpet of flowers? this crumbling building contains nothing but my wish to have been a builder. clearly, our virtuosity has brought us nowhere. Tulip or primrose, they have to speak in their colors. Everyone answers the spring in his own dialect. and if they're good-looking woman, so much the better. What kind of man gets stoned for fun? Day, night, I need obliteration for my grief. facing the shrine the mind at prayer knows just as well. but the great drinkers are always drunk on themselves. I suppose my love for you is a form of madness. Why shouldn't that madness play like fire about your name? if nothing else, we could become good haters. a blinding interval in which to know and suffer. your method may be simply to ignore me. though you never meet, you can always dream of meeting. Come now: I want you: my only peace. I've passed the age of fencing and teasing. This life: a night of drinking and poetry. lest the other guests see my weakness. without a meaning to perceive, what is perception? knowing as you do the aftertaste of all sweetness.